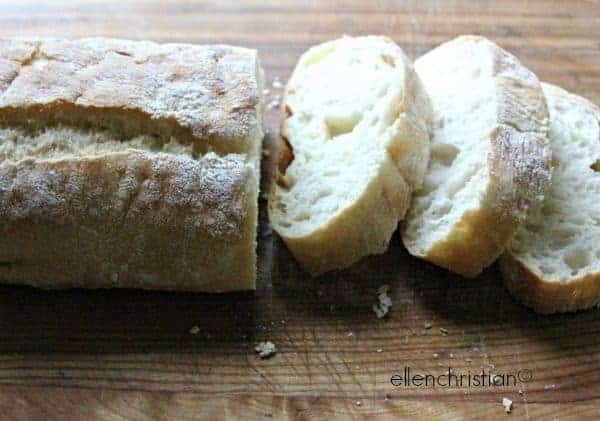 Take a look at how to make homemade garlic bread. It’s the perfect easy healthy recipe to go along with your favorite entree, like our Eggplant in the Oven! Dinner is a very busy time at my home. Everyone is hungry. I am trying to finish up work on my site that needs to be done. The kids want to hurry up and eat dinner so that they can go off to sports activities or to spend time with friends. I try to make sure that I have something healthy to serve for dinner but sometimes I am short on time. I don’t want to buy fast food or something that is overly processed and full of chemicals. When I am short on time at dinner, I generally turn to spaghetti or a pasta dish. To make dinner a little bit more special, I make homemade garlic bread to go with it. 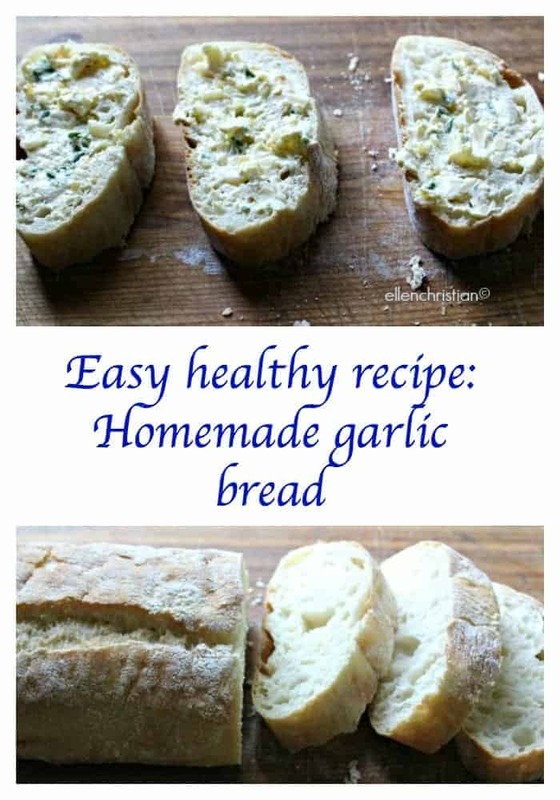 Homemade garlic bread is an easy healthy recipe that anyone can make. Often, the frozen garlic bread that can be purchased at the grocery store is very high in sodium. Since my husband has high blood pressure, he is trying to keep the amount of sodium he eats to a minimum. He loves homemade garlic bread because it is better for him than the high sodium version in the grocery store. Slice the fresh ciabatta bread into slices about an inch thick. In a small bowl, mix the minced garlic, softened butter, freshly grated Parmesan or Romano cheese, the salt and pepper, and the chopped fresh parsley. Spread it on the sliced ciabatta bread. Place the bread, buttered side up, on a piece of tin foil in the oven. Broil it at 450F until the butter melts and the top of the ciabatta bread starts to get golden brown. Check the homemade garlic bread after about 3 minutes to see if it is done. Watch it carefully as it will burn if you leave it in the oven for too long. When you remove the homemade garlic bread from the oven, you can sprinkle on more grated Parmesan or Romano cheese on top if you want to make homemade cheesy garlic bread. Either way it is delicious. Ellen is a busy mom of two teenagers who left the corporate world in 2008 to focus on a more eco-friendly life. She lives in rural Vermont where she juggles family, two blogs and a career in social media. You can find her at Confessions of an Overworked Mom and The Socialite's Closet. Wow wonderful. It is a great and healthy recipe. This sounds delicious. If We didn’t just have store bought garlic bread yesterday I would give this a try. Maybe we will make our own butter as well. That is super easy to do. MMMM That looks SO amazingly good! There is nothing better than homemade bread! This looks yummy!! I want to make home made breads one day due to clean eating. Thanks for sharing! I agree with Diane. I like to make it at home to avoid all the preservatives and other food additives that normally come in packaged foods. We just had spaghetti tonight…this would have gone perfectly with it! 🙂 Thanks for linking up at the Inspiration Gallery! We do this alot. i dont like buying premade garlic bread because you really don’t know what sort of ingredients they use! Have an Eco-Friendly, Budget-Friendly Thanksgiving!